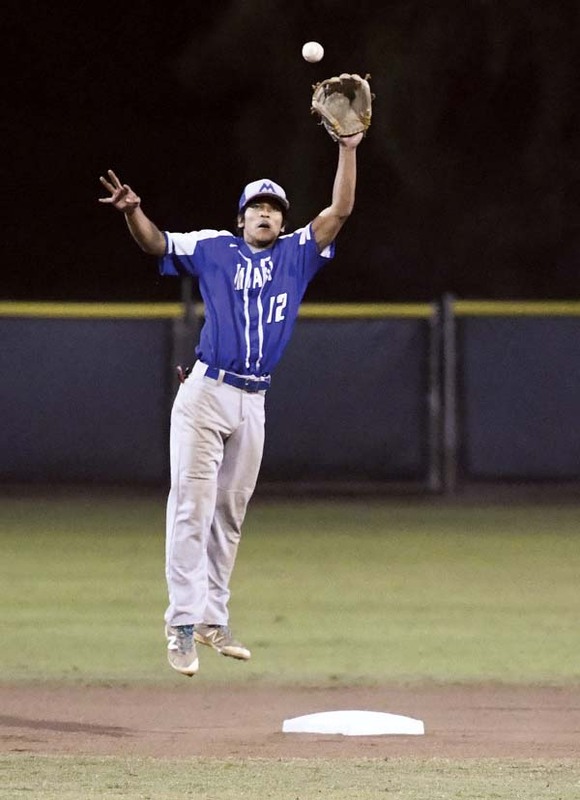 WAILUKU — The final two games of the Baldwin High School baseball tournament on Friday at Maehara Stadium featured the two teams from the Maui Interscholastic League that have won the last two Division I state titles facing off against two top off-island opponents. For Baldwin, the 2016 state champs, the early season answers are becoming clearer. With “12 or 13” Major League Baseball scouts in the stands to watch Bubba Hoopii-Tuionetoa pitch for the Bears and Micah Bello play center field for the Hilo, Baldwin came up big in a 10-0, five-inning win over the Vikings. Bello smacked Hoopii-Tuionetoa’s first pitch over the left-field fence on a bounce for a ground-rule double. From there, Hoopii-Tuionetoa dominated in a complete-game three-hitter in which he struck out three and walked two. In the final game of the night, defending state champion Maui High lost to Saint Louis 9-3. The Crusaders broke a 2-2 tie with four runs in the top of the fourth inning — Charles Lopez drove in two runs with a single, Caleb Lomavita followed with an RBI single, and the final run scored on a wild pitch. Mikito Barkman, who pitched four-plus innings and took the loss, had RBI singles in the first and fifth innings, while Hauoli Caliva had an RBI single in the third for the Sabers. First-year Maui High coach Leonard Barcoma declined to comment after the game. The Bears pounced for six runs in the third inning, taking advantage of three Hilo errors — the only hit in the frame was a single by Bobby Drayer. In the fourth, Baldwin added four more runs on an RBI double by Kevin Varner, a two-run double by Jacob Chong and a run-scoring error. 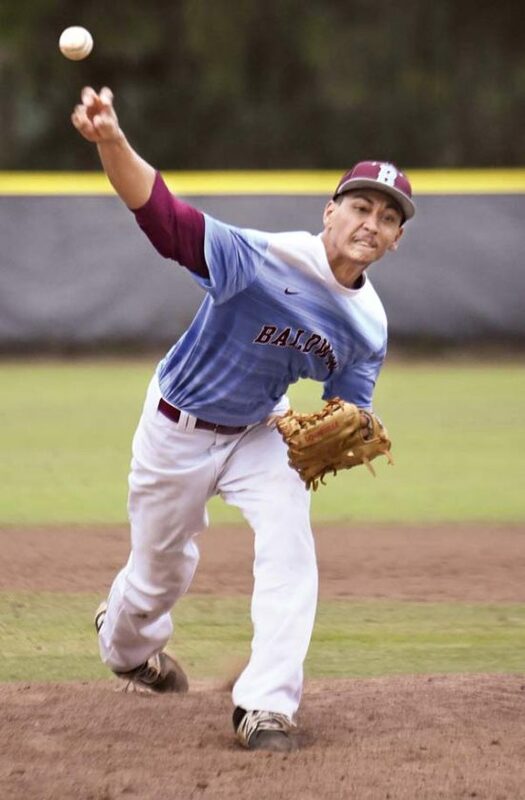 Baldwin coach Shane Dudoit was pleased with Hoopii-Tuionetoa, who rebounded from a four-inning, four-run outing two weeks ago against Maryknoll. There were only two scouts in the Maehara Stadium stands two weeks ago, but Hoopii-Tuionetoa said he is getting used to the attention that his 92-94 mph fastball is bringing. The best part of the attention is helping to bring his teammates into the spotlight, Hoopii-Tuionetoa said. Vikings coach Tony DeSa said he hopes to see Hoopii-Tuionetoa and the Bears again. “He kept the ball down, his fastball had good pop to it,” DeSa said. “Our kids had some good swings on it, but we couldn’t bunch hits together. He kept us out of it by throwing a lot of strikes and letting his defense work. Donald Saltiban, Briden Silva (4) and Ryan Cabreira; Bubba Hoopii-Tuionetoa and Cade Kalehuawehe. W–Hoopii-Tuionetoa. L–Saltiban. 2B–Hilo: Micah Bello; Baldwin: Kevin Varner, Jacob Chong. Leading hitters–Baldwin: Nainoa Keahi 2-3, 2 runs; Varner 2-2, run, RBI. Kanoa Meredith, Makaio Bruchal (5), Charles Lopez (7) and Caleb Lomavita; Mikito Barkman, Tyrell Ruiz (5), Makana Lalim-Rillon (6), Jyrah Lalim (7) and Hauoli Caliva. W–Meredith. L–Barkman. 2B–Saint Louis: Lomavita. Leading hitters–Saint Louis: Lomavita 3-5, 3 RBIs. Maui High: Barkman 2-4, 2 RBIs. Cyrus Robson, Graydon Tanda (1), Isiah Duarte (4) and Ross Panlasigui; Andrei Stoyanow and Landon Kuroda. W–Stoyanow. L–Robson. 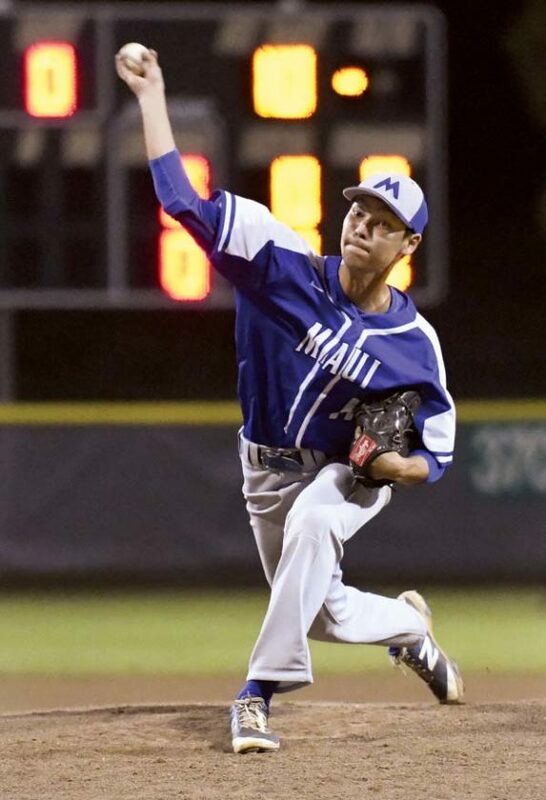 2B–Kapolei: Isaac Badua, Stoyanow. HR–Kapolei: Stoyanow. Leading hitters–Kapolei: Badua 3-3, 2 runs, RBI; Stoyanow 3-3, 2 runs, 3 RBIs; Dray Kawewehi 3-3, 2 runs, RBI. Tyler Apilado, Keanu Silva (4), Blake Probasco (5), Jaisten Medeiros (6) and Lanakila Lovell-Obatake; Michael Beesing, Keanu Pakele (5), Ty Otani (6) and Koa Hashimoto. 2B–Kauai: Probasco; King Kekaulike: Tani Kaholoaa, Brendan Yamamura. 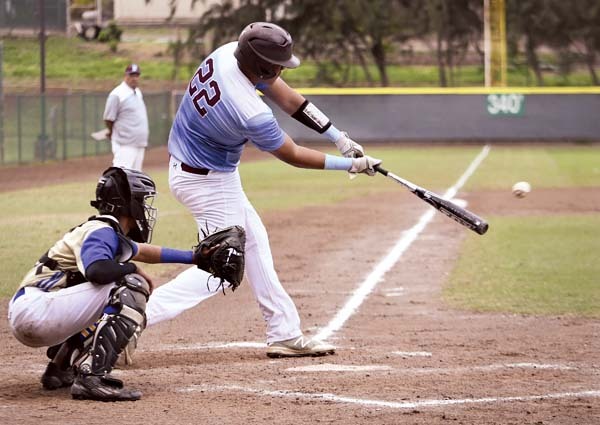 Leading hitters–Kauai: Probasco 2-3, 2 RBIs. King Kekaulike: Matthew Hackett 2-3, run, RBI; Hashimoto 2-3, run, RBI.